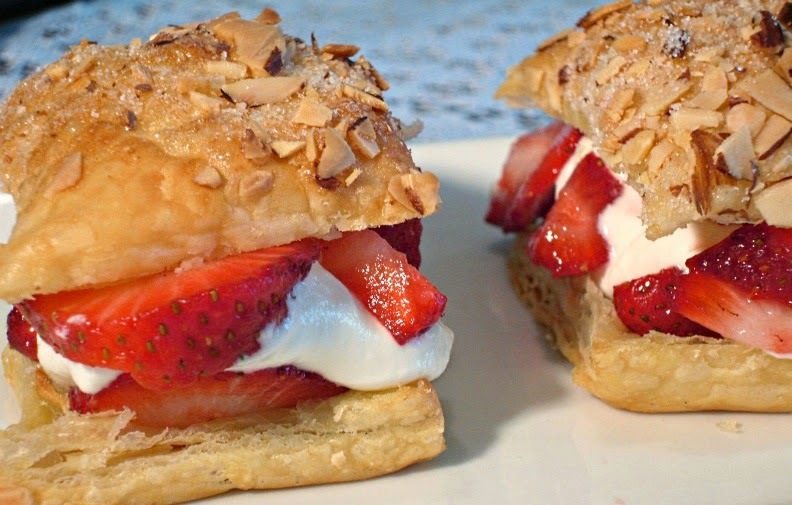 With very few ingredients, you can make these impressive pastries! June is Strawberry Shortcake Month and Driscoll's Berries is kicking off this event with a recipe contest for the best Strawberry Shortcake! The Daily Meal - Culinary Content Network is teaming up with Driscoll's Berries to find the best recipe for America's favorite summer dessert! I think we all love those little sponge cake circles filled with berries and a squirt of whipped cream, but this recipe adds a little crunch with the almonds and a delicious Amaretto cream. It's a great combination! Preheat oven to 400 degrees F. Unfold pastry dough onto baking pan. Finely chop half of the almonds and combine with granulated sugar. Sprinkle evenly over surface of dough. Lightly press almond mixture into dough. Cut dough lengthwise into three strips; cut strips crosswise into four squares for a total of 12 squares. Gently separate squares evenly over surface of pan. Bake 16-18 minutes or until puffed and golden brown. Remove from pan onto cooling rack. Meanwhile, place remaining almonds into a small saucepan and cook over medium-high heat 2-3 minutes or until lightly toasted, stirring occasionally. Remove from heat and cool. Coarsely chop. Whisk sour cream, powdered sugar and almond extract in a medium bowl. Fold in whipped cream. Slice strawberries. 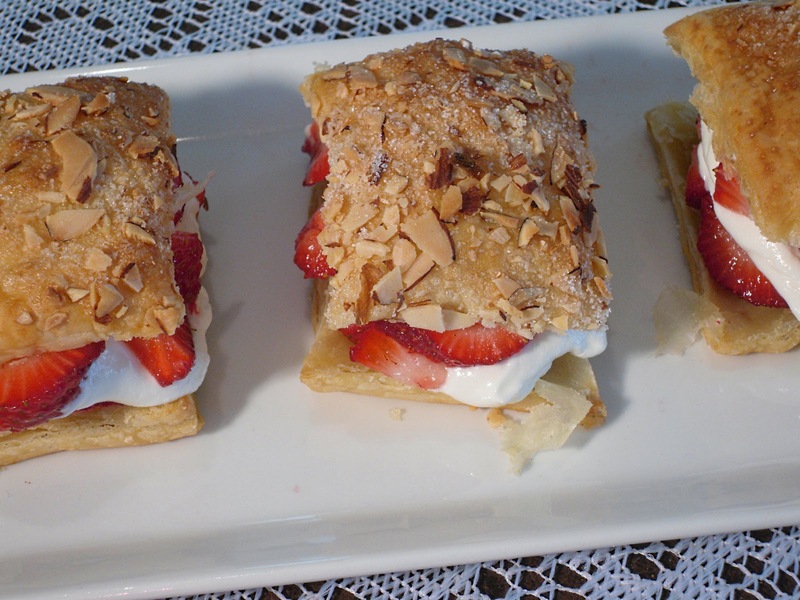 Split open each pastry square; arrange half of the strawberries into bottom of each shell. Top with about 2 heaping tablespoons of the filling and sprinkle with chopped almonds. Top with remaining strawberries. Zest orange over strawberries. Place tops of pastry shells over filling. Serve immediately. These are dainty and delectable! Cooks Tip: If not serving immediately, fill right before serving. Sliced peaches can be substitued for the strawberries. Man, I wish I could come to your shows! This is so easy and it looks SO good girl! Perfect dessert for spring and summer! These look divine! You make the who process sound so simple perhaps even I,(one with the pastry dough fear) could handle this one!!! mmm mmm yum! looks delish! I'm visiting from Sweet as Sugars link party. Hope your weekend is wonderful! These look decadent and delicious. Oh My, I could eat them all. Happy Sweet Saturday! These look fabulous! Do you have a post that tells about your cooking show? I would love to hear about it. Someone wants me to turn my blog into a show and I am not wanting that much committment! These look like something you would buy in a French pastry shop. Yum! What a perfect treat right now as plump, red and HUGE strawberries are coming into season! I'd like to try to make these soon, and I wish I could attend one of your cooking lessons! I love this..I havent tried to make this one before..I just eat whenever I can when I go out. This looks like a star for sure! I love almond and I love how light and delicious this looks! Yum, those look like a perfect spring treat! Btw, I'm following from Seasonal Saturday and hope you will join my Spring Blog Hop, too. These look amazing, Patti. All ingredients I really love and have a weakness for too. Thank you for sharing this recipe at Joy of Desserts. I didn't realize you have a show. Now I'm going to have to search your archives and see if I can find more information on that. You should put a link to the show on your post. Looks great, and real easy to make. Thanks for sharing this! I am going to try it soon, since I have puff pastry in the freezer just waiting to be used. Looks delicious! What a lovely show-stopping dessert. Thanks for linking this up to Sweets for a Saturday.